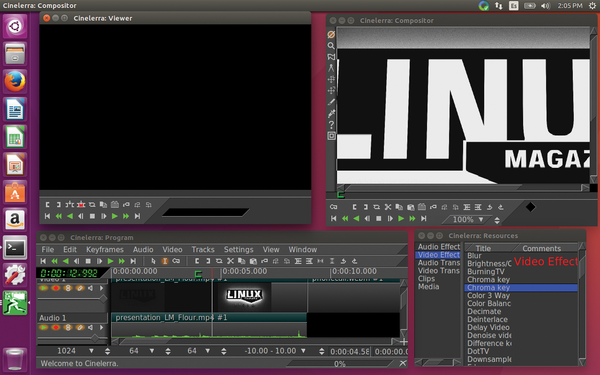 If you shoot a video and want to edit it in Linux, you might get confused by the sheer number of free editing programs. The web pages for these programs contain information about a multitude of features and functions. Some free programs even attract the attention of professional filmmakers. This article compares the features and the performance of several open source video editing programs. For testing, we selected Cinelerra, Flowblade, Kdenlive, Kino, LiVES, and Shotcut, together with the proprietary but free Lightworks. Most of these programs follow the lead of Adobe Premiere Pro, a professional video editing program, in terms of how they work. Film snippets are assembled via drag and drop onto a time line and then exported as a new file. Developer Adam Williams places a lot of emphasis on the value of stable software. Therefore, he updates the video editing program Cinelerra  just once a year, making only a few changes each time. Williams offers an archive with a binary version for the 64-bit version of Cinelerra for Ubuntu 14.04 on his homepage. However, users of other distributions will need to compile the source code. Once Cinelerra starts up, it opens several windows (Figure 1). The first of these windows displays a preview of the completed film. The second window contains the time line, and the third offers rudimentary media management and access to all effects. Cinelerra 4.6.1 proved extremely picky about the type of video file it handles. For example, the program refused to open HD videos in the widely used AVCHD format, nor would it open videos in Ogg format. And, just one of the many MPEG4 videos in the MOV container opened without any problem. Figure 1: Cinelerra requires a considerable amount of space on the desktop because of its numerous windows. Cinelerra can load videos from the hard drive and also import videos from an analog TV card, webcam, DVB card, and Video4Linux device. If desired, the software also records the output of a display screen and thus quickly creates a screencast. Cinelerra immediately transfers imported clips to the time line. By switching into the viewer window, you can edit the film snippets with absolute precision. Alternatively, you can use the mouse to move the ends of snippets together on the time line as desired. Basically, however, editing clips in the time line is cumbersome. First, you have to switch into the appropriate select and edit mode, use the mouse to select the area you wish to cut, and then, finally, click on the correct button to remove the area. Cinelerra always applies operations to all currently active tracks. Therefore, you must be careful to avoid accidentally editing two video clips simultaneously. In the current version 4.6.1, Cinelerra can divide the time line into two independent areas. This approach is helpful to those working on complex projects. The representation on the time line can only be marginally reduced. This limitation results in constant scrolling even with smaller projects; however, you can set markers that act much like bookmarks. To apply an effect, you should first mark the area of the clip for including the effect. Then, drag the desired effect from the Resources window to the corresponding video track. Each effect will appear below the clip as a bar. By clicking on the small symbols found with the bar, you can quickly switch the effect on and off and also open its settings. The settings for effects appear in a separate window and consist entirely of sliders. As soon as these sliders are positioned, you'll see an immediate impact on the preview. Cinelerra supports key frames that let you adjust the effects over time. The compositing window is the helper for picture-in-picture effects. This window displays the output of the time line and has tools to let you modify the size of the video output and drag it onto the virtual screen. Cinelerra does not offer templates for exporting a completed video. Instead, you are responsible for selecting the correct output format and the appropriate compression method. Making the right selection involves accounting for bitrate, color model, and the I-frame interval for MPEG compression. However, Cinelerra does have the capability to distribute the processing of the finished film to multiple computers in the network. Flowblade  is a video editing program written in Python that is based on the MLT multimedia framework (see the box entitled MLT). Version 1.4 was the most current version of Flowblade when this article went to press. At the time, the developers were only offering the program as a DEB package for Ubuntu versions 16.04, 15.10, and 14.10, as well as Debian 8. Users working with other distributions were responsible for resolving Flowblade's multiple dependencies on their own. In testing Flowblade, we were able to download and decompress the Flowblade source code archive and then start the flowblade script. MLT, which stands for Media Lovin' Toolkit, is a multimedia framework that was originally developed for use with television broadcasting. MLT has a compact modular construction and a thin API, making it well suited as a foundation for video applications. After starting flowblade, you are presented with an elegant and orderly user interface (Figure 2). The preview is found at the upper right, and the time line is located at the lower edge. Unlike many of its competitors, Flowblade can generate and manage multiple independent time lines or sequences. Although Lightworks lets its users nest sequences, Flowblade does not. Moreover, each of the Flowblade sequences offers only nine tracks. When generating a new sequence, the user will need to determine how many of these tracks will have videos, and how many of them will record audio material. The Flowblade developers specified these limits arbitrarily. Figure 2: Unlike its competitors, Flowblade makes it easy to recognize cross-fades. To the upper left of the main window are several tabs. The first tab offers a small media-management function that lets you import clips and then drag and drop them into the time line. The function does not work smoothly, and its use is not intuitive. Depending on the track and the clips already on the time line, Flowblade adds the video snippet to another clip, edits the new video, or moves the videos that follow. Beginning users, in particular, will need to reposition the clips with the appropriate tools until becoming more proficient. Flowblade offers several different editing tools, one of which can even move or roll a cut-over point. Given the large tool set, you'll need to remember which tool is currently active. You can cut clips directly in the time line. Alternatively, you can double-click to move the film snippet into the preview window in order to cut it with the help of appropriate buttons. Experienced users may want to display a vector scope and an RGB parade. These two special modes provide a look at the color composition and color balance of the video. To assemble video clips precisely, all editing programs have time lines with various zoom levels. In Flowblade, you control the zoom level by turning the mouse wheel or using the somewhat inconvenient menu options. The track height is not adjustable. On larger monitors especially, this action changes the rectangles of the clips into narrow lines. Flowblade offers compositors and filters on other tabs. Filters involve effects that always apply to the entire clip. Compositors, however, mix two video tracks, creating cross-fades or picture-in-picture effects. Unlike the settings for filters, compositor settings are controlled via keyframes. You can specify the starting and ending points on a separate time bar in the compositor settings. Flowblade conveniently synchronizes the time needle on the time bar with its counterpart on the time line. A wizard is available for creating titles. The window for the wizard displays the video from the time line in the background, letting you position text with a high degree of precision. The wizard even permits multiple layers of text. However these layers cannot be displayed or hidden separately. A virtual mixer console lets you modulate the sound. If desired, Flowblade adds a watermark to the video; competing programs do not offer this convenience. To export the film after editing, you switch to the Render tab. This tab offers numerous format templates. Users familiar with video compression methods can supply additional parameters to Ffmpeg, which is responsible for the video coding. 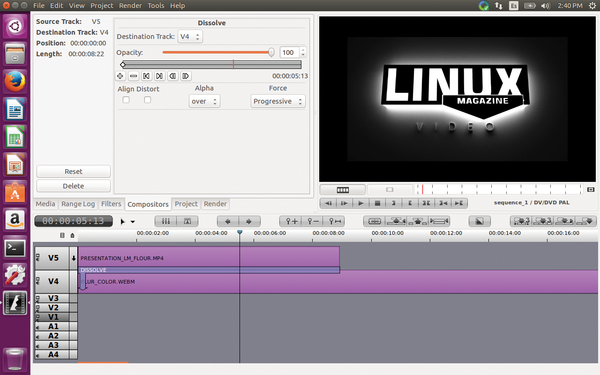 Jean-Baptiste Mardelle of the Kdenlive team, announces the release and availability of Kdenlive 0.8, a free and open source video editor for Linux.